I’ve been to three shows at Red Rocks so far – Bob Dylan with My Morning Jacket in 2007, Tom Petty and the Heartbreakers with Joe Cocker in 2010, and most recently, another round of Tom and the boys with Steve Winwood this past October. At this latest show my Tom Petty partner-in-crime and I found ourselves wandering backstage with All-Access passes. (You’ll have to buy me a beer to hear that whole story…) I mention the passes because while we were actually backstage for part of the 2010 show as well, we didn’t have the same freedom to wander that the passes gave us this time. 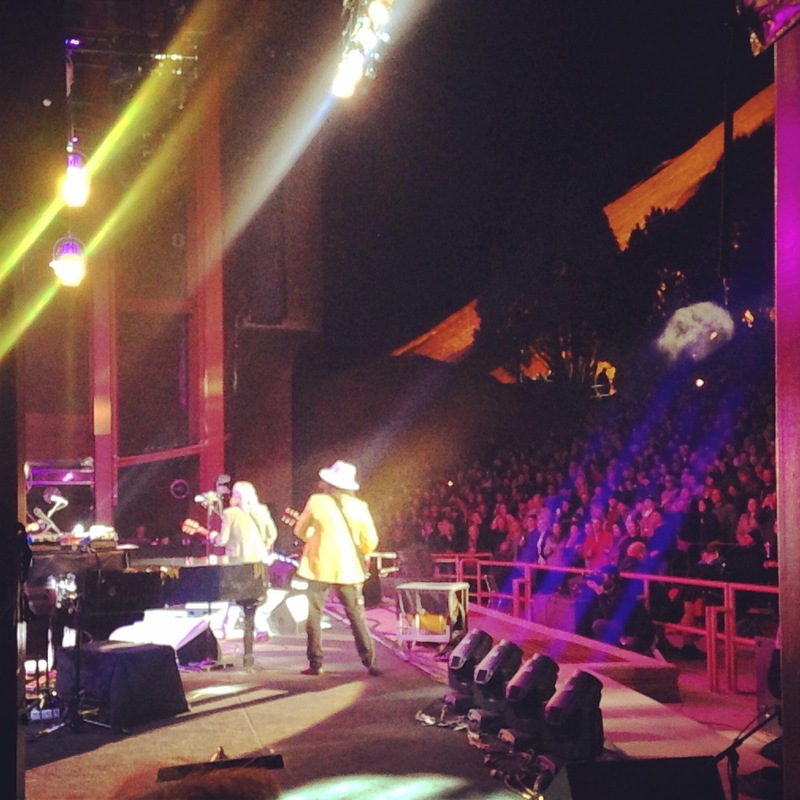 And let me tell you, if there’s a place that’s fun to wander – it’s backstage at Red Rocks. The walls are lined with framed prints of the legends that have graced the stage in this historic venue and the stairwell to the stage is covered with hundreds of scrawled signatures from those performers. Even without such decoration the backstage is unlike any other, built as it is around the natural rock formations of this incredibly unique place – some rooms have huge boulders for walls, bringing the outside right in. Wandering these hallowed grounds we did our best to balance freaking out and keeping our All-Access cool. But it got me wondering – how did this majestic venue, 15 miles outside of Denver and surrounded by wilderness on all sides, come to be? Technically, you could start a history of Red Rocks about 160 million years ago. Contained in the two gigantic sandstone monoliths which form the natural amphitheater, Creation Rock and Ship Rock, are fossils and tracks from life in the Jurassic period. But, this isn’t a science blog so let’s skip ahead a few million years. In the early 20th century a magazine publisher named John Brisben Walker (fun fact: the founder of Cosmopolitan magazine) recognized the incredible natural acoustics at work and began producing small concerts on a temporary stage built into the space, then known as the Garden of Angels. 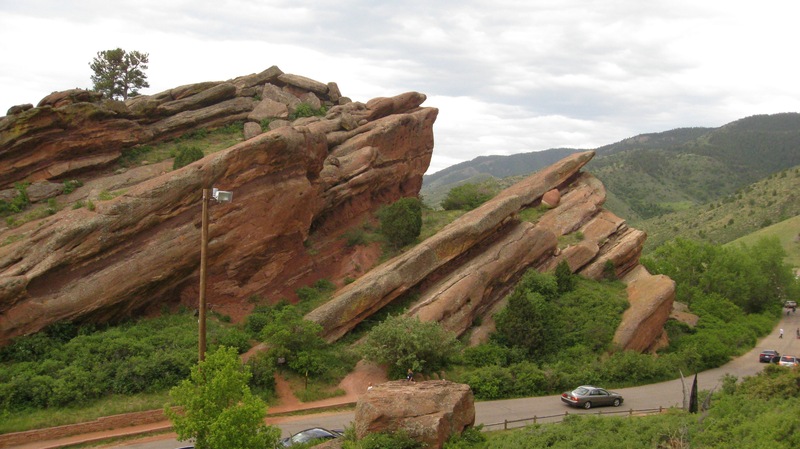 The City of Denver purchased the land containing Red Rocks from Walker in 1927 and began expanding on what he had built there. After the onset of the Great Depression labor from the Works Projects Administration and Civilian Conservation Corps built the venue, with a strong focus on maintaining the natural integrity of the area. 1947 saw the first official concert season at Red Rocks, kicked-off as it has been every year since with a sunrise Easter service. Performances in that era were largely visiting symphonies, ballets, and big bands, with legends like Louis Armstrong and Ella Fitzgerald making appearances. But on August 26, 1964, the sea change that was washing over the country swept Red Rocks up with it when The Beatles made it a stop on their first U.S. tour. Interestingly, it was the only date on that historic tour that didn’t sell out. Some blame the distance from downtown Denver and the lack of public transit options available at the time. Others blame the steep ticket price ($6.60), but for whatever reason only about 7,000 of the 9,000+ seats were officially filled. The Fab Four played a 30-minute set out of a two-hour show that also included The Righteous Brothers, The Bill Black Combo, Jackie de Shannon, and The Exciters. The 6,450-foot altitude hit the lads from Liverpool hard and they had to use oxygen canisters on the side of the stage during their performance. More than fifty years later, Red Rocks is one of only four venues played on that 24-city tour that is still operating today. After The Beatles, Red Rocks hosted a stream of legendary performers. While the concert seasons were still dominated by the kinds of shows it thrived on pre-Beatles, a new wave of popular acts were now sprinkled in the mix. Artists like Simon & Garfunkel, Johnny Cash, The Mamas & The Papas, and Peter, Paul, and Mary all made it onto the roster. In September 1968, Jimi Hendrix took the stage for a concert with Vanilla Fudge and Soft Machine that remains the only known contemporary show at Red Rocks without a single documented photo or video. I‘m sure there must be fan photos stuffed away in shoeboxes somewhere but not a single official photo exists. Sadly, it is left purely to the imagination but the sonic prowess of Hendrix bouncing off Creation and Ship Rock could certainly have created something approaching a religious experience. While Red Rocks sat on the musical sidelines during the summer of 1969 (no big deal, just WOODSTOCK and whatever…) they were back in the rock game the following year, but not for long. On June 10, 1971 Jethro Tull stopped at Red Rocks for the second date of their Aqualung tour. In the post-Woodstock world the unpleasant phenomenon of “rock should be free” gate-crashers was a plague on festivals and concerts nationwide. When an estimated 1,000 to 2,000 ticketless gate-crashers showed up at the sold-out show police tried to direct them to an area outside of the amphitheater where they would be able to hear, but not see, the concert. But the crowd wasn’t looking for a compromise and many attempted to storm the gates, scrambling over fences and past barriers into the seating area. A full-scale riot broke out, culminating with the Denver police chief himself dropping tear gas onto the crowd from a circling helicopter. The members of Jethro Tull fought past police barriers to take the stage, in an Altamont-type effort to calm the crowd and end the riot. Emergency medical efforts were taking place backstage as Ian Anderson urged the crowd to cover their faces with clothing and bring any children up to the relative-safety at the front of the stage. After that disastrous debacle, deemed “The Riot at Red Rocks” Denver’s mayor, William McNichols, vowed that there would never be another rock show at the venue so long as he was in office, and enacted a ban on rock performances that stood until it was challenged in court by concert promoter Barry Fey in 1975, where it was overturned. 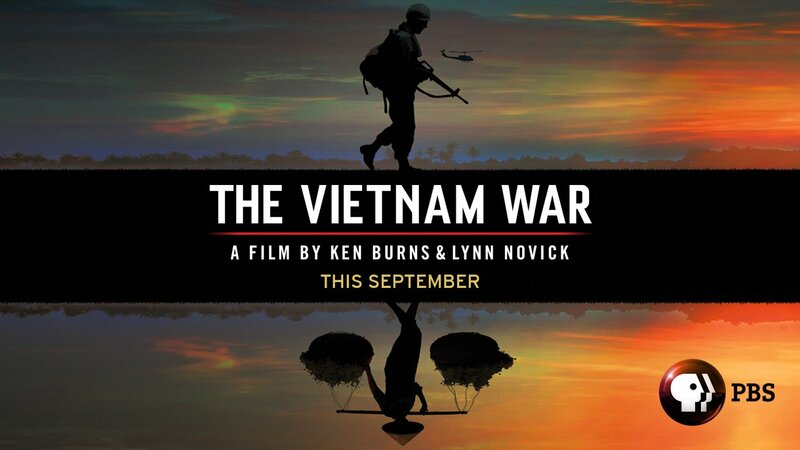 So from 1971 to 1975 while albums like Exile on Main Street, Eat a Peach, and Led Zeppelin’s IV were being released, the Red Rocks concert seasons included performances by Burt Bacharach, Pat Boone, The Carpenters, and Johnny Mathis… To be fair, these were also the years that songs like “Seasons in the Sun” and “Tie a Yellow Ribbon Round the Old Oak Tree” were topping the Billboard charts, but Red Rocks was once again sidelined from the rock & roll scene. 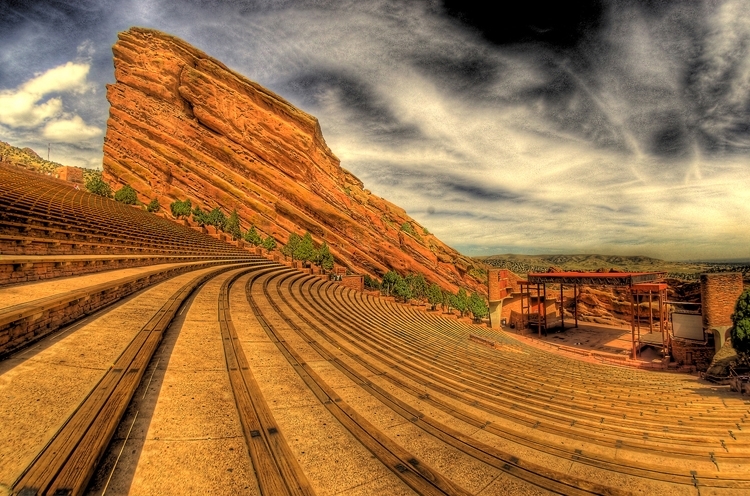 Folk acts did thrive at Red Rocks during the rock ban. Joan Baez, Judy Collins, Pete Seeger, and Arlo Guthrie all made appearances in those years, along with acceptable popular artists like Neil Diamond, Joni Mitchell, Carole King, and Merle Haggard. When the ban was lifted in 1975 Red Rocks didn’t exactly dive headfirst into the rock scene – booking artists like James Taylor and America. But it didn’t take long to get back into the swing of things, and by the end of the decade Blue Oyster Cult, the Eagles, the Grateful Dead, the Allman Brothers, the Kinks, Cheap Trick and many more would grace the stage. Since then, Red Rocks concert seasons have included a steady stream of up-and-coming artists, megastars, jam bands, and legends. A staggering number of live albums and videos have been recorded at the venue, trading on the incredible natural acoustics of the space. U2, The Moody Blues, Stevie Nicks, Neil Young, John Denver, The Dave Matthews Band and many more have all released live Red Rocks performances. The 2015 season promises more memorable performances at the legendary venue. Jackson Browne, Mark Knopfler, Steely Dan, John Prine, Steve Miller, and many others are all scheduled to take the stage before the Colorado weather shuts the place down in mid-October. If you haven’t experienced the splendor of Red Rocks I would certainly encourage you to make the pilgrimage to this great national treasure. Nice article, Alison! I’m an old U of O friend of your parents and I lived in Colorado for 30 years before moving to Seattle in 2011. We moved to Bogota, Colombia this past January. Red Rocks is by far the best outdoor music venue I’ve ever been to…and I’ve seen a lot of concerts there! I’m a little jealous that you live there now, as Colorado was one of my favorite places to live. My daughters both still live there…in Boulder and Fort Collins. Enjoy your adventure there….get out as much as you can. It’s beautiful country. I look forward to following your blog! Thanks so much, Jane Ann! I am loving Colorado so far. We certainly feel lucky to have landed here :) I hope you’re enjoying your adventure in Colombia, thanks for reading! What a great post, Alison! I hope to make it to a show there, someday.